Real estate service Zillow has given its mortgage marketplace app a significant revamp, introducing a fresh design, revised navigation features and the ability to request quotes for underwater refinancing programs. That latter point is particularly notable, the company says, since it is a first for any mobile app. 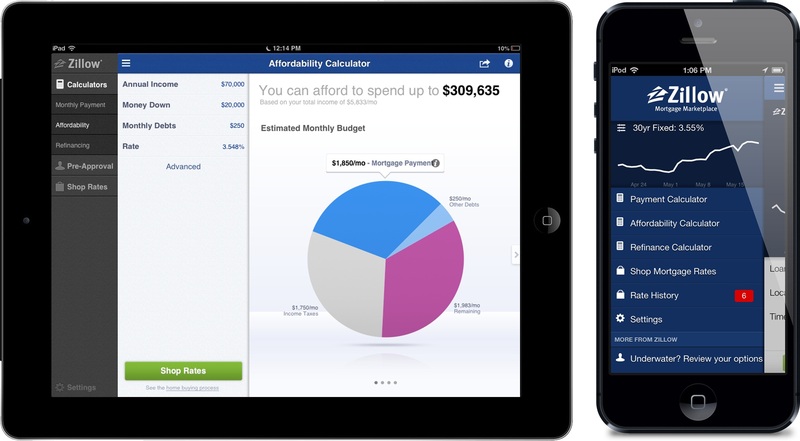 In layman’s terms, Zillow for iOS can now provide mortgage owners with negative equity with details, information and loan quotes from refinancing initiatives such as the Home Affordable Refinance Program (HARP) and FHA Streamline Refinance. The programs — which are designed for homeowners whose outstanding mortgage repayments are greater than the value of their home — were previous only available on the desktop version of the service. Now Zillow is making things easier for under-pressure homeowners to get help right from their phone. Design-wise, the overhauled app sports a revamped landing page and home screen to enable faster access to information, a navigation bar and color coding has been added to make the quote section more easily navigable. Likewise, perusing past rates is easier thanks to a slide interface for charts, while in-app calculators also include graphics that make selecting the best deal a more visual experience. We often hear stories of underwater homeowners who get discouraged because one lender told them no, or because they couldn’t afford the fees associated with a particular refinance quote. The beauty of the mobile marketplace environment for homeowners is that they have access to hundreds of competing lenders, right in the palm of their hand, who may be able to help within seconds. It is imperative that homeowners not give up in their quest to refinance. The company says that almost 14.5 million loan requests were made through its Mortgage Marketplace service over the past year, although we don’t know the number of downloads that its app has seen to date. However, the Seattle-based firm says that its broad range of services, which include property rental and buying services, are used by 52.5 million users per month. The changes are solely for the iOS at this point, and the Android version remains unchanged.